One such issue was Fernando Reges forgetting how to defend. In our analysis of Manchester City’s win over Chelsea early in the season, we highlighted the basic principles of 1v1 defending that Nemanja Matic seemed to be struggling with. Throughout the game, Fernando’s defensive decision-making, poor 1v1 technique, and over-aggression caused many of the same problems for Manchester City’s defenders. Only seconds before the first goal was created by Xherdan Shaqiri, Fernando was in a comfortable position, with little space to defend near the touchline. 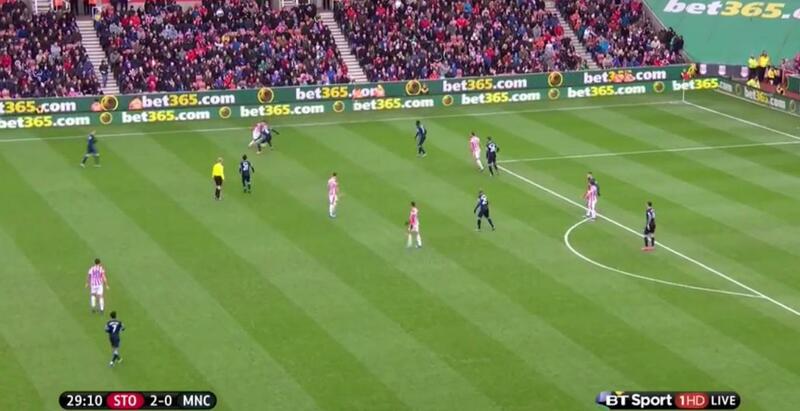 But a rash slide tackle allowed Shaqiri to dribble to the byline before making a great cross for Arnautovic to finish. 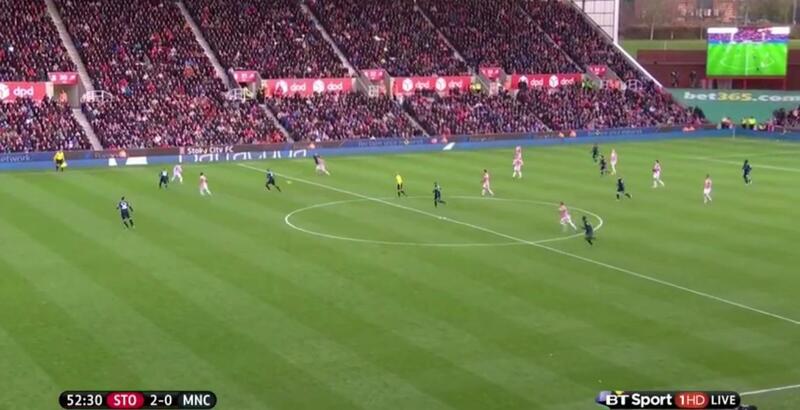 Fernando attempts to close the passing lane to Shaqiri, but should realise he won’t get there in time to do so. He is easily turned by Shaqiri, who threads another great ball for the onrushing Arnautovic. Aside from big mistakes leading to goals, he also seemed to exhibit fundamental flaws in his defensive technique. Fernando exhibits much the same technique as Matic in attempting to tackle Bojan here. Instead of operating in a side-on stance so he can run with Bojan as he pushes towards the byline, he is face-on to Bojan meaning he cannot shift quickly and Bojan gets past him easily. Face on tackling against Bojan again. This time he tries to reach over with his left leg when it’s clear his right isn’t going to be able to reach the ball. No luck. Stoke utilising the quick dribbling of Xherdan Shaqiri, Bojan & Marco Arnautovic in these areas made it extremely difficult for Fernando. They seemed to break through City’s midfield with ease, and were often left 1v1 with Martin Demichelis, who also had big issues when defending 1v1. But this is a flaw that everyone in the footballing world knows Demichelis has, unlike Fernando. It is no wonder that City are so much more successful defensively with Vincent Kompany in the team, because he is capable defending the large space the midfield often leaves him to cover. Martin Demichelis is not. 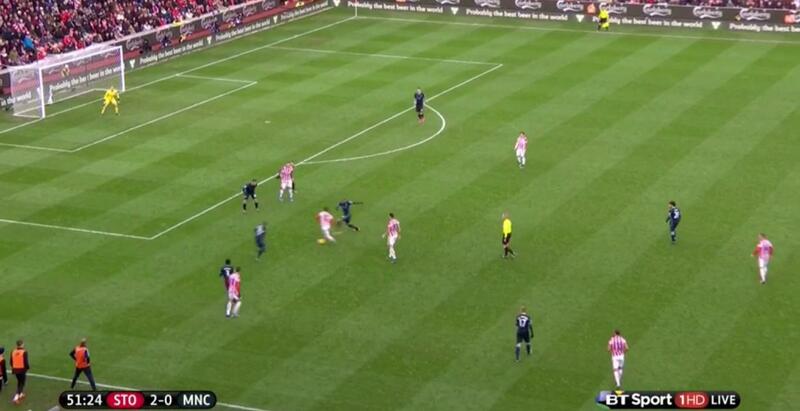 Often Demichelis makes up for his poor agility and 1v1 defending with good positioning, but this was also not the case. There were signs that he and central defensive partner Nicolas Otamendi were not fully in tune with each other. 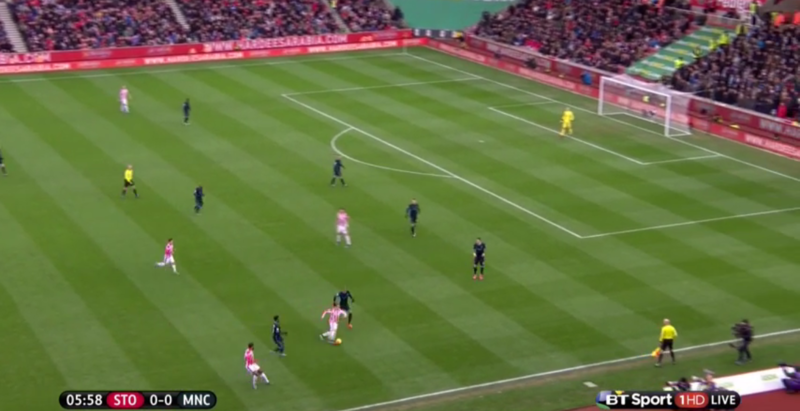 Often they were too far apart, and Demichelis would also occasionally hang five yards deeper than Otamendi, attempting to sweep up play but actually making it easier for Stoke’s runners to stay onside. Otamendi pushes forward aggressively to leave Bojan 1v1 with Demichelis. It seems unlikely that he understands what Demichelis does (or in this case, doesn’t) do well. Throughout Pellegrini’s reign at City, there have been major issues with defensive shape and compactness. But what has been consistently of a good level, is City’s attacking in the halfspace. We analysed their title-winning 13/14 campaign, and how they were able to target the halfspace with ease through clever movement from David Silva and the fullbacks, particularly Pablo Zabaleta. Zabaleta has seemingly been banished to the bench, with Bacary Sagna often preferred, even when Pellegrini wants attacking impetus from the RB role (as he did today, with Kevin de Bruyne often roaming from his position). But more important is the lack of fluidity David Silva had against Stoke in the #10 role. Silva’s peak came in City’s 4-2-2-2, where he was able to roam laterally and create overloads with Samir Nasri. His main form of movement against Stoke came in the form of rigid interchanges with Kevin de Bruyne, who often tried to push into central areas. Silva would also drop deep to attempt to influence the game, but this does not utilise his quick feet and exquisite 5-10 yard passing skill that makes such a difference around the edge of the box. Manchester City’s pass map during the 60 minutes Silva was on the pitch; very little interplay around the edge of the box. Only Kolarov applied any sort of attacking impetus in these areas. This was only partly due to sub-par attacking from City. 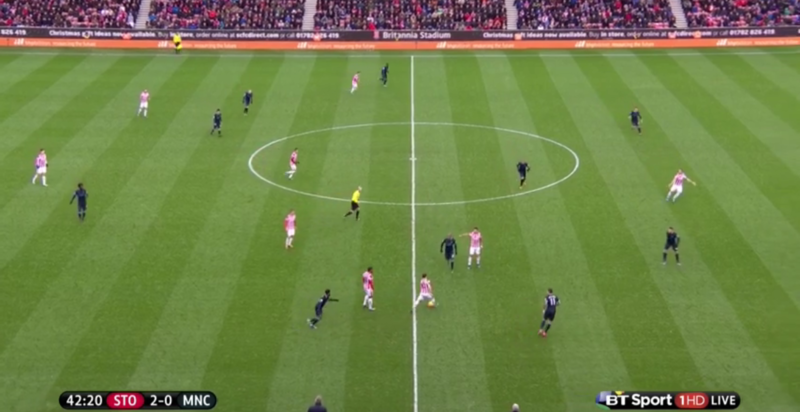 Their poor shape made it easier for Stoke to defend, but the positioning of Shaqiri, Bojan & Arnautovic in defensive phases was also key to ensuring Stoke were able to transition quickly. Much of the danger could already be spotted, even when City still had the ball. Fernandinho’s positioning is too wide. If City lose the ball (as they do), he is completely out of the game as Stoke have are able to quickly move the attack past Sagna & Sterling, creating a 4v2 against an on-the-floor Fernando, and Martin Demichelis. 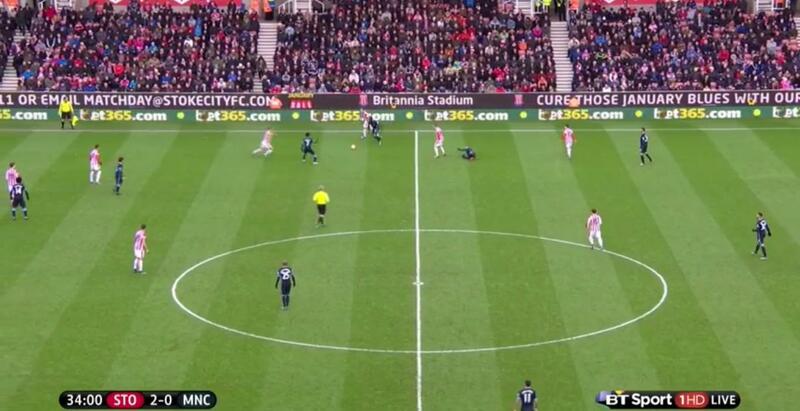 Manchester City could have dealt with the problems Stoke presented easily with minor tweaks in positioning. But these issues keep returning, and when such a key part of the offense is faltering, they look a far less daunting opposition to come up against.